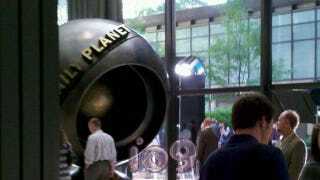 Behold Zack Snyder's brand new Daily Planet, fresh from the Man of Steel set in Chicago! We've heard that Chicago's Board of Trade building is being used for exteriors for the Daily Planet (which is kind of funny, because it's also the exterior for Wayne Enterprises in The Dark Knight). But now take a look at the interiors of the Daily Planet and the famous metal globe! Thanks for the tip and photo, Dave.